Seattle Property Management, Seattle Property Managers, Seattle, MO Property Management Companies. Our Professional Property Management in Seattle neighborhoods can help you take back some of that time; time you can spend on the more important things in your life like hiking, surfing, family. Spend the extra time with your children or grand kids. You could even take a vacation. We'll carry your burden of Seattle Property Management. Seattle property owners like you trust Dave Poletti to be their property manager! At Dave Poletti & Associates, we understand the overwhelming demands Seattle's marketplace can make on property owners. Collecting rents, finding and screening tenants, advertising, performing inspections and arranging for repairs, getting all this done can take an army, not to mention accounting and keeping up with the latest in landlord/tenant law. We've developed the most complete, flexible and customizable array of Seattle Property Management Services in Seattle to help you maximize your property's investment potential while minimizing your risks and help you free up more of your valuable time. Finding quality prospects is always a challenge, especially for a property owner working alone. Dave Poletti & Associates has the knowledge and experience needed to aggressively targeting our advertisements, finding quality tenants and income for you in the shortest time possible. Based right here in north Seattle, the team at Dave Poletti & Associates knows the local market and what works best here. Showing your rental is often the most time consuming step in the leasing process. Never again miss a sale because you don't have a moment to spare. Our Property Management professionals are always available to show your vacancy, anywhere in Seattle. Screening Prospective Tenants is more important, and more complicated, than ever before. A mistake here can cost you thousands of dollars in overdue rents, property damage and legal fees. In extreme cases, a mistake can even be dangerous! Dave Poletti's 18 years of experience with Property Management in Seattle give us the knowledge, resources and contacts to run quick, accurate and cost effective Credit and Background Checks. When we pre-qualify your applicants we protect your investment and save you money, up-front and in the future. Dealing with the endless cycle of collecting checks, paying vendors and performing the monthly accounting can take all the fun out of property ownership. Having to confront tenants over late payments, bounced checks and property damage can add more stress to your life than you really need. Don’t let the drudgery of owner management ruin your life and your Peace of Mind. Shield yourself from the daily Property Management grind with our Professional Seattle Property Management Services. So, if you’ve come to dread confrontations with your tenants, and the never-ending cycle of management responsibilities, let us shield you from the Daily Grind. Contact Dave Poletti & Associates about our flexible and affordable Professional Seattle Property Management Services and put the fun back into owning property. We All Need Time-Off Sometimes, for vacations, for business trips, for family emergencies, but it can be difficult to find someone you trust to run you business while you’re away. Go ahead and pack! We offer any and all of our Seattle rental management and property management services on a short-term basis. Do you want the peace of mind of knowing some one will be there if things go wrong? Our Maintenance and Repair team will protect your investments. Need someone to run the whole show for you so you can enjoy your free time again? The expert staff at Dave Poletti & Associates is ready to step in and do it all, making your rent deposits and sending you Easy to Understand Monthly Statements where ever you land. Don’t stay chained to your business forever! 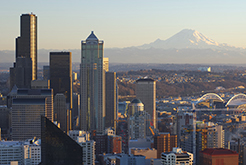 Sign up for our Seattle Property Management Services now and Take Some Time Off. Don’t stay a slave to your investment property. Call Dave Poletti & Associates today for the most dependable, cost-conscious Rental and Seattle Residential Property Management Services. Take Back Your Time for the important things in your life. Seattle is a major coastal seaport and the seat of King County, in the U.S. state of Washington. Logging was Seattle's first major industry, but by the late 19th century the city had become a commercial and shipbuilding center as a gateway to Alaska during the Klondike Gold Rush. By 1910, Seattle was one of the 25 largest cities in the country. Seattle is located between the saltwater Puget Sound (an arm of the Pacific Ocean) to the west and Lake Washington to the east. The city's chief harbor, Elliott Bay, is part of Puget Sound, making the city an oceanic port. Seattle's climate is usually described as oceanic or temperate marine, with mild, wet winters and warm, dry summers. Seattle's mild, temperate marine climate allows year-round outdoor recreation, including walking, cycling, hiking, skiing, snowboarding, kayaking, rock climbing, motor boating, sailing, team sports, and swimming.